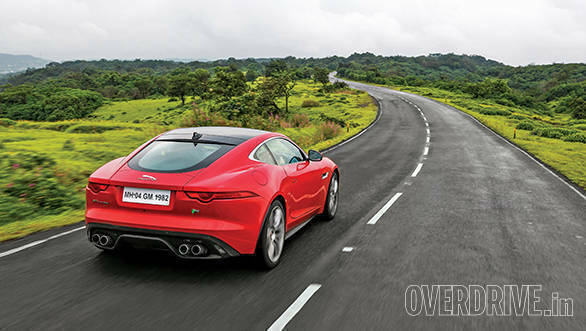 The F-Type R Coupe is many wonderful things but a precise and finessed driving tool it isn't. It's too much of a hoon-happy hot rod for that. And I was getting rapidly aware of this as I climbed the thrilling ribbon of tarmac that heads towards Aamby Valley. The road started off dry and I was pushing the Jag hard. The car was in Dynamic mode which sharpens up the steering and suspension and adds even more of a knife's edge to the throttle. And just to make things extra interesting I had the traction control in Trac DSC mode which allows a very generous slip before it steps in to save your bacon. The F-Type was surreal - lots of grip, even more power and a noise to wake the dead. A properly exhilarating sportscar experience. But then it started to rain, and that's when the animal in the R Coupe was roused! Suddenly I found myself in a constant and hugely entertaining battle with the steering wheel. The Jag's tail was sliding out at the slightest provocation and needed an armful of opposite lock at nearly every corner exit to keep it headed in the right direction. There's so much power and such sharp response from the 5.0l supercharged V8 that anything more than half throttle will swing the Jag's gorgeous behind out of line. After about fifteen adrenaline flooded minutes I had to tone it down and get my pulse back to more human levels. Such is the F-Type experience. When you pause on the side of the road to get a breather (which you inevitably will) it's far from a waste of time. And that's because you're essentially staring at a piece of modern art. It's quite feline with a hint of aggression up front and is almost indistinguishable from the convertible face first. But good god, would you look at that rear end. The F-Type Coupe has got to have one of the finest derrieres in the business. It's the perfect mix of sinewy haunches and smooth curves. The roofline descends in one graceful arc from the front windscreen all the way to the thin and sharp tail lamps. And the whole effect is capped off with an aggressive diffuser that houses four exhaust tips from hell. Our car came with the optional glass roof that further adds to the drama. The insides are sporty and well built but don't have quite the drama of the exterior. But there are some lovely touches like the gold-finished start button, paddle shifters. And your passenger will be very grateful for the grab handle engineered into the centre console. But my favourite part of the cabin has to be the seats. They feature adjustable side bolsters so that the driver, no matter the body shape, is snug and supported. The F-Type makes such a loud and epic noise that it reduces small children to tears. Hand on heart; I'm not making this up! Our tracking shots involves multiple runs up and down the same stretch of road at moderate speeds. As Suresh was shooting from our Grand i10 a small group of street urchins gathered to watch. On one of these runs I came to a halt a little ahead of them, checked my mirrors and spun the F-Type around with a sharp stab of the throttle before briefly flooring it on my way out. Predictably, this generated the F-Type's signature grating roar accompanied by a series of whip cracks, bangs and pops from the exhaust. The next thing I hear is a loud bawling noise interjected by lots of hysterical laughter. Turns out the youngest kid in the group burst into tears out of sheer shock while his friends were thrilled with what they just saw. I'm sorry little boy, that terrifying red beast isn't trying to hurt you, it's just doing what it does best at the hands of a driver who simply couldn't help himself! 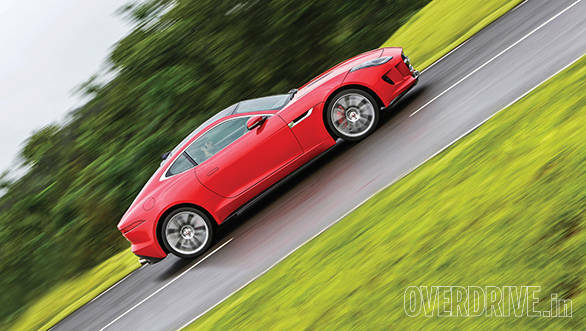 Make no mistake; the F-Type is not a hard car to drive, well at least not at slow speeds. Once you get used to the low seating position and sharp throttle it's quite easy to putter around at low speeds. You can hit the exhaust button on the centre console which significantly mutes the exhaust (the roar sets in only after 4,000rpm) and suddenly you have an easy, reasonably comfortable grand tourer . The suspension is most definitely stiff but not to the point of being undriveable on a daily basis. Also, we discovered that it can handle speed bumps quite well, needing a sideways ascent only over the sharpest ones. But once the speeds climb, and they do so very fast, you have to have your wits about you. The sheer violence with which the 550PS/680Nm 5.0-litre supercharged V8 propels this car down the road can be quite disconcerting to the uninitiated. 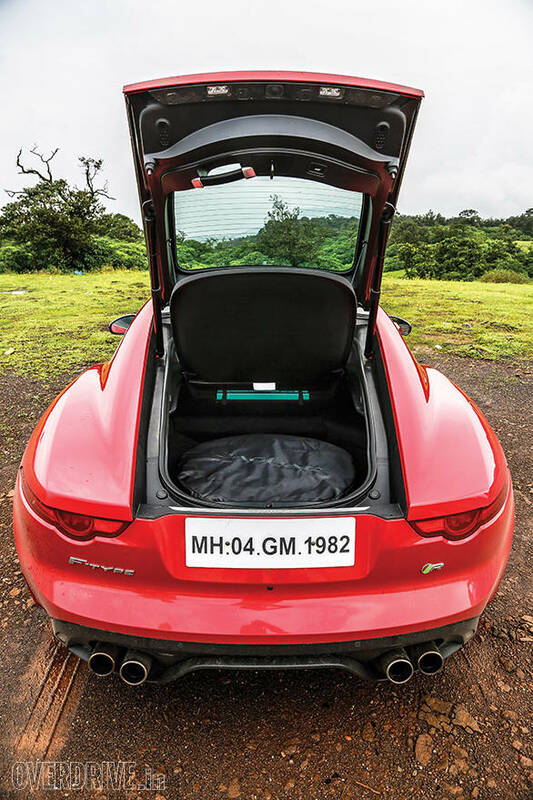 We recorded a 0-100kmph time of 4.4 seconds and we have no trouble believing Jag's claimed top speed of 300kmph. 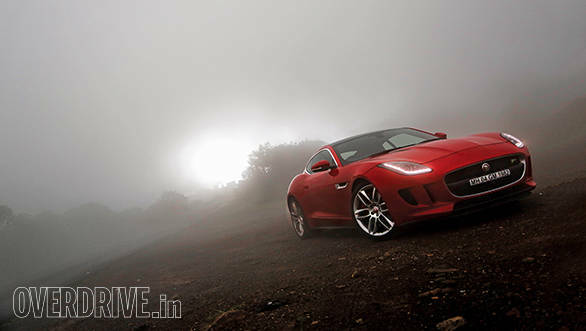 The F-Type hits 200kmph with the effort it takes your average sedan to hit 120kmph. 250kmph comes with disturbing ease and the angry V8 is still raring to go. 300kmph will be pretty realistic if you find a stretch of tarmac that is long and smooth enough. 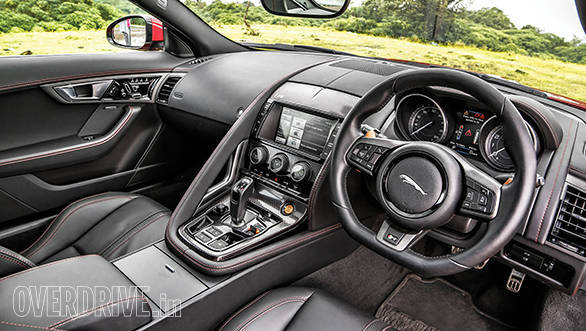 The F-Type doesn't come with a dual clutch gearbox but the 8-speed automatic is perfectly up to the job. Drive sedately and you won't even notice it. But select dynamic mode and the shifts arrive with a hard hitting thud that you'd only experience with every fast machine. However, the R demands your full attention when you begin to push it on a winding road, even with the ESP fully engaged. Unlike some other systems the ESP cuts in after it detects some slip and doesn't prevent the slip from actually happening. Which means clumsy jabs at the throttle will result in a wiggle of the hips. Switch to Trac DSC and as I mentioned earlier, things can get quite hairy if you're on a narrow road. And we'd only suggest you switch ESP off on a wet road if you're absolutely sure of your capabilities. But the F-type R Coupe also supports you with strong brakes, torque vectoring and a very well balanced, predictable chassis. The hydraulic steering has quite a bit of heft but it lacks a little in terms of feedback. Nevertheless it is very precise and helps you place the car accurately .Essentially, the F-Type R Coupe expects you to work but it will put a huge grin on your face for your efforts. Or is it? The Rs 2.33 crore R Coupe's biggest rivals are the 911 Turbo and the R8 V10 and both cost significantly more (about Rs 25 and 40 lakh more respectively). They're both also down on power to the Jag (by 30 and 25PS respectively). By the end of the drive I was sure that I'd have been much faster up the same road in the same conditions in either of the other two thanks to the tenacity of their excellent all-wheel drive systems. But there was no doubt in my mind that the Jaguar, while slower in those conditions would have been more fun and left me with more memories. It's not an easy car but it rewards you tremendously. Simply put, it's a car you love, respect and fear in equal measure. And that makes it a very special machine.